Ohio and Erie Canal lock 22 is located in Groveport Park. 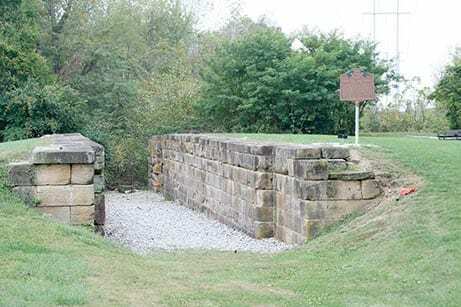 The Ohio & Erie Canal Southern Descent Historic District, which includes Lock 22 in Groveport, has been officially added to the National Register of Historic Places. “My reaction? I was excited beyond all words!” said Cathy Nelson, an independent historical preservation coordinator, when she heard about the district receiving this recognition. Groveport city officials were pleased to hear the news, too. Westcamp said history is important in Groveport. The Ohio & Erie Canal Southern Descent Historic District includes 14 historic canal sites along a 100 mile stretch of the old Ohio and Erie Canal in central and southern Ohio. The sites include Groveport’s lock 22, located in the northern part of Groveport Park, as well as the following other locations: Bibler Lock (lock 8 in Baltimore); locks 26, 27, 29, and 30 in Lockbourne; the Big Walnut guard lock to the Columbus feeder canal near Lockbourne; lock 2 of the Columbus feeder; lock 31 near Ashville; the Scioto River aqueduct abutment and piers located about 650 feet downstream from the U.S. Route 22 bridge; the Circleville feeder inlet; the watered canal prism near Circleville and Westfall; lock 48 near Rushtown; and lock 50 Union Mills near West Portsmouth. Most of these nearly 190-year-old features are significantly considered to be in fair to good condition. Local government officials, historians, private citizens and others from along the route worked to gather information for the National Register of Historic Places nomination. Jeff Darbee, an historic preservation consultant with Benjamin D. Rickey & Co. of Columbus, wrote and completed the nomination form, aided by Nancy Recchie, and with comments from the State Historic Preservation Office at the Ohio History Connection. Matt Leasure, of the firm Designing Local in Columbus, prepared the mapping. Darbee said the National Register listing is “a kind of seal of approval” showing that a property or district is historically significant and worthy of preservation. It does not require any public or private owner to maintain or restore a property, or open it to the public. According to Darbee, the listing allows communities to show the sites were professionally vetted as historic and important and some grant-making foundations and other funding sources require that properties seeking funds must be National Register listed. The Ohio and Erie Canal was completed between 1827-32 and wound 308 miles through the state connecting Lake Erie at Cleveland to the Ohio River in Portsmouth. The canal, a man-made waterway that was an engineering marvel, was built to enhance transportation and shipping in the state. During the canal’s heyday in the 19th century, 55 locks were situated on the Ohio and Erie Canal from the Licking Summit in Newark to the Ohio River. The locks’ function was to raise and lower canal boats to meet the changing level of terrain. Lock 22 in Groveport is nearly 190-years-old and is made of sandstone block. Its overall length is 117 feet and its chamber is 90 feet long and 16 feet wide. The lock’s purpose was to raise and lower canal boats to meet the changing terrain. The lock is owned and maintained by the city of Groveport and is accessible from Groveport Park and Blacklick Park. The canal channel is still visible near lock 22 as well as in Groveport’s Blacklick Park and along Rohr Road south of town. Additionally, a dry dock and canal boatyard operated in the 1800s in what is now Blacklick Park. The canal operated in Groveport from 1831 to the early 1900s and the transportation opportunities it offered for shipping and travel were a significant factor in the economic development and growth of the city.